Please note: Online ticket sales have now closed. The Catholic Church has always been a great supporter of the arts, most noticeably in the great works of Art that adorn some of our finest churches, captivating the minds eye with the image of the Divine. This also stands true of poetry itself. Poetry is most notably found in the Liturgy fo the Hours (the Divine Office) as an alternative to the more traditional hymn in preparing us for our work of prayer. There have also been many great Catholic poets over history including Dame Edith Sitwell, Gerard Manley Hopkins and Joyce Kilmer. The Archdiocese of Cardiff is pleased to announce that it will play host to Cardiff’s first poetry festival in support of this beautiful art from. 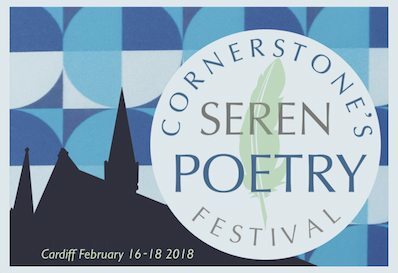 In co-operation with Seren Books the weekend of February 16-18 will see some of the finest modern day poets showcase their work with readings, films, artwork, music and celebratory lunches all within the beautiful setting of the Cornerstone, Charles Street, Cardiff. Join us in discovering the beauty of poetic prose in what is sure to be an uplifting weekend. As part of the weekend’s schedule our own Archbishop George Stack, a great fan of poetry himself, will be interviewed by Cardiff-based poet Gwyneth Lewis about his favourite poems.